Some social media experts are surprised by business owners who aren’t paying attention to social media. They are surprised that these companies are missing out on the opportunities, ignoring the chance to connect with customers, be part of the word of mouth about their products and services, etc. I’m surprised companies don’t realize they’re already on social media. Regardless of whether a company gives social media the time of day, if the business has anyone is ever talking about it, chances are it is already on social media. In fact, there are very few companies that aren’t, or at least don’t have someone connected to the business that is, and in that case if they ever talk about work on their social media accounts, then the company is on social media. People talk about your company whether you have a fanpage or not. They still mention you, chat with their friends about you, post about their experiences,etc. So yes, you or your company are on social media. The Question Is: Do you care? Do you care what people say about your company? How Should This Affect Your Opinion of Social Media? Instead of thinking of social media as something you might spend some time investing into, maybe it’s time to consider each of the ways social media affects business. You can’t monitor what people say about your company off the internet. No matter what there will be conversations you just can’t be part of. 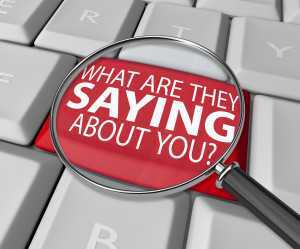 For years we’ve accepted this about business, but now, you can monitor what people are saying about your company online. Simple monitoring of just your brand name, product names and your name can give you immediate access to what people are saying, if for nothing more than the education and perspective it provides into your business. Take it a step further and give people the place to talk about you, by having profiles on the largest social media websites: Facebook, Twitter, Google+, Linkedin. In the United States alone more than 90% of active internet users have Facebook accounts. With millions of people having access to social media, it is very common to see customers posting to their accounts for customer service. I’ve done it myself, when I had a problem with our local Pizza Hut, and within minutes they responded. Social media is an easy access for customers to share their frustrations (and satisfaction) but, even better, there is an audience. Social media users know that when they complain about your company on Facebook and Twitter, their message is being seen by dozens to hundreds (if not thousands) of other users, thereby affecting their opinion of your company. This isn’t something you should immediately fear, but be aware of. Ignore them– when a company does this, the users who see the frustrated customer’s posts tend to lose respect and loyalty for the company. To them, it’s just like ignoring a phone call, but now they all know you ignored it. It shows you don’t value what your customers or your target market think of your company, and they will go looking for a competitor who does. Answer and Defend– there is good defense and bad, but neither are the best way to handle public conversations. Just like you would instruct your telephone customer service reps, your goal is to turn the experience around, help the customer and keep them as a customer. Being defensive and lashing out just calls for bad press, and more trouble as people come out to defend the initial customer, by sharing their own unhappy stories. You know the people that post on Twitter about EVERYTHING they do? These people have a deep connection with their friends and followers and when they need to make a purchase, guess where they go? They jump right on Twitter or Facebook and ask. With a more comprehensive monitoring campaign you can look for messages related to your product to be able to offer a free trial, recommend a version of your product, or even sell your services. The same people we discussed above will also post about their problems. For instance, a stove that doesn’t work, their charger stopped working, or they are lost in a city. If your company can help any one with a problem (as most products and services do) monitoring for certain keywords with a website like Tagboard can help you find potential business. When someone who uses social media a lot comments about your company in a positive way, and you have an active social media profile that can be tagged into the comment, you have a positive review for anyone interested in visiting your profile. These positive reviews are not easy to gather otherwise, but are very effective for marketing. In Jay Baer’s current book Youtility, there is a graph that shows how many sources of knowledge the average person needs to make a purchase for various products. For instance, when voting they needed 10 sources, 18 for buying a car, and 4 for fast food restaurants. Chances are, your customers need more than one source, so having public recommendations and reviews can be an added bonus of social media. Set up appropriate profiles, fanpages, channels, etc. Get started today, have your marketing department start working on social media, or hire an expert from my social media experts database. And, if you have any questions, let me know below! Thank you for visiting and please share on social media if you enjoyed this article. This post is great! Topics as social media and reputation related to online business are more then ever up-to-date! It’s more or less impossible to control what people say about our company, but i believe that gathering reviews is a frutable way to use the opinions of our customers. The feedback collection can be tricky, my advice is to commit this task to professionals of this field (for example eKomi, the feedback company). This way you can have the reviews published directly on your website, and in case of negative opinion you can get in touch with the unsatisfied client through the third-party. It’s capital that the company you decide to hire uses a transaction based system to collect the reviews to make sure that only people who experienced your service/product are allowed to leave their comment. Feedbacks can also be publisched on your Facebook page to show what your real customers say about you!